Have you been coasting along avoiding really learning the basics of SEO? 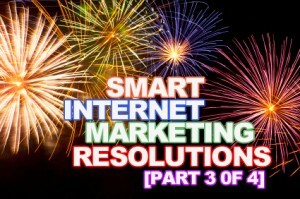 If getting a handle on SEO has been on your list of resolutions for years, now is the time to dig in and charge ahead. In fact, procrastination in the past might have served you well. After last year’s Google Penguin update many websites were hit hard by the new standards, and some marketers had to unlearn bad habits they had developed. For part three in our series on creating a better marketing plan for 2013, we take a look at how to do Calgary SEO right. Don’t stuff pages with keywords. Don’t create pages with duplicate content. Don’t create pages just for search engines. Don’t use hidden text or links. As many people learned after last year’s update to Google’s search algorithm, using these strategies can now hurt your site’s rankings. The goal of Calgary SEO is to optimize your site for your customers, not a search engine. When you think in terms of customer experience optimization (CEO), people will come to your site, return frequently, and tell others about it. Good writing for websites is still good writing. Yes, you should use keywords, but use them in a way that makes sense, and feel free to use related terms as well. Use those keywords in your page titles and URLs. Create strong titles that draw your readers in. Titles should be clear, confident, and intriguing. They should also be brief—keep them under eight words. Good writing for the web is clear and gives readers what they were looking for. Here’s the real secret to Calgary SEO: having a website with relevant content is more important than ranking first. Of course, common sense has been telling us this for years. The best way to draw in new visitors and keep the regular visitors coming back is to provide engaging content on a frequent basis. Fresh content establishes your website as a credible source for valuable information. It can help you bring in new readers. It gives you greater opportunities for inbound links as others share your content, and it gives you more readers through social sites. The more you have, the more people will share. Consider your website with a critical eye. How does it create a great customer experience? Where does it fall short? Your design should be easy to navigate with a clear purpose that engages your visitors. If you were coming to the site for the first time, would you be able to find what you wanted? Would you remember how to get there the next time? Now look at your site on your phone or tablet. Does it still measure up? The shift toward mobile browsing is very real. A Google study from last year found that 61% of people said if they couldn’t easily find what they were looking for on a mobile site, they would leave. The best Calgary SEO does everything possible to ensure visitors keep coming back for more. After years of using tricks to manipulate their way to higher rankings, the Google Penguin update caught some marketers and their clients off guard. Knowing your way around SEO is about learning from the mistakes of the past and understanding the best practices of the present. The lesson for the future is to avoid the tricks and develop a marketing plan that emphasizes good design and incorporates high quality and highly shareable content.